Maurice earned Second Team All-Big 12 Hounrs as a senior after catching 57 passes for 814 yards and 9 touchdowns with the Nebraska Cornhuskers in 2007. Going undrafted, Purify signed with the Cincinnati Bengals in 2008 where he’d see time on special teams, recording 5 tackles in 2009. 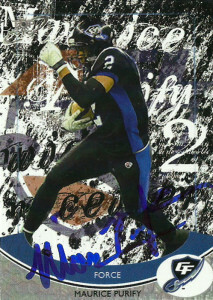 He joined the Georgia Force in 2010 and was named Rookie of the Year and Breakout Player of the Year. Maurice also earned Second-Team All-Arena honors after leading the Georgia Force with 130 receptions and 46 TDs, while finishing second on the team with 1,653 yards receiving. In 2011, Maurice decided to play for the UFL, but an injury landed him on injured reserve for the majority of the league season, so Maurice returned to the Arena leagues, this time signing with the powerful Arizona Rattlers. He’d go on to catch 126 balls for 1,932 yards and 46 touchdowns that season and earn First-Team All-Arena Honors. He’d be a key component in the Rattlers ArenaBowl XXV victory, as he’d be named Offensive Player of the Game for his seven touchdown performance. Maurice resigned with Arizona for the 2013 season, but was injured for much of the year. Still he’d post up 51 receptions for 740 yards and nine touchdowns in nine games, and two touchdowns in the team’s return to ArenaBowl XXVI. Maurice was the last of the ‘big 3’ that I was after from the Rattlers that evening. He went over to sign autographs before the game, so I had to dart across the stands with pen in hand to get him. Still I ended up with his autograph on this sweet looking card of him from his days with the Force.